Can kettlebells help before, during, and after pregnancy? The response to the post about women, kettlebells, and muscle mass has been overwhelming. Thank you very much and I am glad it inspired many women to ditch the old unjustified fears and start pursuing kettlebell training. Yes, the e-mails of support were abundant but so were the e-mails from a group who felt the post, while encouraging and headed in the right direction, did not apply to them and felt left out. Many moms felt that simply getting in shape, let alone back into pre-pregnancy shape, required an army of personal chefs, trainers, and other services beyond their means. Popular culture perpetuates pregnancy as changing the body unfavorably and permanently. Even a popular TV Fitness Icon (who shall remain nameless) stated she’d never get pregnant as pregnancy ruins a woman’s body. The influence of mainstream, though misguided, is indeed powerful! And I agree wholeheartedly and that is why I seek the wisdom of those who have been in the trenches. I cannot posibbly understand the experience unless I live it myself, and since that is physically impossible, I seek the expertise of those who not only have lived it and overcome the changes but also helped others realize there is a way. Well… Not so fast! Moms are using kettlebells to have their bodies back in months instead of years as is popularly thought. Yes, sometimes you can have your cake and eat it too. Putting up with a flabby weak body should not be the price women have to pay for the joys of motherhood, not when they can use kettlebells under proper guidance to reclaim their self-esteem. Yes, I know, I am a guy so what do I know? Hey, don’t take my word for it! Instead ask The Kettlebell Queen, Lauren Brooks Miller, who showed it is possible to be in amazing shape after pregnancy. Lauren got herself back in combat-ready shape after delivering her first child, a big 7lb 9oz baby girl. Now, that may not seem much but in proportion to Lauren’s body that’s a big kid. Lauren used short, high intensity kettlebell workouts to accomplish her goal. There weren’t any of the “small weights for hundreds of reps for toning” time drainers. Lauren pushed heavy iron in her intense training. Let the pictures speak for themselves! “So what?” The skeptics may be saying “That is only one Kid”. Well, hold on! Here comes the second baby! Lauren used a modified kettlebell and bodyweight training approach to stay fit during her second pregnancy. 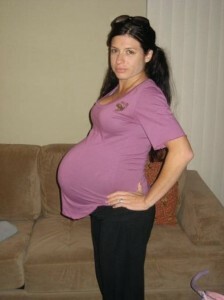 She documented the experience and now has a DVD to guide moms through pregnancy fitness using GASP! Kettlebells. No need to let the bells gather dust and rust abandoned in a corner, if you know how to use them, they’ll serve you well and keep you fit regardless of the circumstances. Back to the topic, baby girl number 2 was even larger at 8 ½ lbs and had to be delivered via C-Section. Ah, that dreaded word! If regular pregnancy alone is hard on the body, a C-Section makes it all more difficult. A C-Section delivery is seen by many moms as the farewell to any hopes of ever reclaiming their bodies. How can there be hope of getting back in shape after that procedure? True, it was not going to be easy but Lauren was determined to silence the doubters and give hope to moms. Short, intense kettlebell workouts were again worthy components of the program and again, a thousand words find their worthy substitute. Lauren is now the inspiration and role model for thousands of women who seek her advice via her popular kettlebell classes in Southern California or through her instructional kettlebell videos. She has classes and DVDs dedicated exclusively to the moms who seek to be in shape during and after pregnancy. 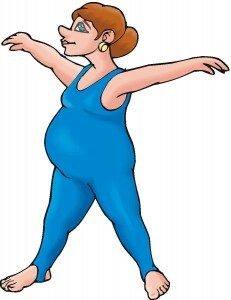 Many women in fact, rave they are in their best shape ever, even when compared prior to pregnancy. If anyone has expertise in this area, it is undoubtedly Lauren. Kettlebell conditioning will help moms before, during, and after pregnancy and there is no need for moms to feel they can never regain their shape. Popular wisdom was once very certain about the Earth being flat so don’t get discouraged by what others may be saying. There is no substitute for hard work under smart guidance. Of course, it is always wise to consult with your physician for his/her blessings and have realistic goals. If you have never exercised and want to lose the post-pregnancy pounds, kettlebell training will help you. It may take you a little longer to get there but be consistent, seek guidance, and do not give up. My gratitude to The Kettlebell Queen Lauren Brooks Miller for her permission to use her images to help inspire other moms and let them know it is possible to be a mom and be in incredible shape. Lauren has been selected as one of the top trainers in San Diego and serves the Encinitas and Sorrento Valley areas in Southern California. Visit her website On the Edge Fitness for information on classes or for great Videos on Kettlebell Workouts for Moms. Looking for Kettlebells? Click the image below for awesome bells!